A new state-of-the-art building in a Portsmouth academy includes staircases covered in times-tables and portraits of some of the city’s most famous residents, including Rudyard Kipling and Arthur Conan Doyle, on the walls of its canteen. 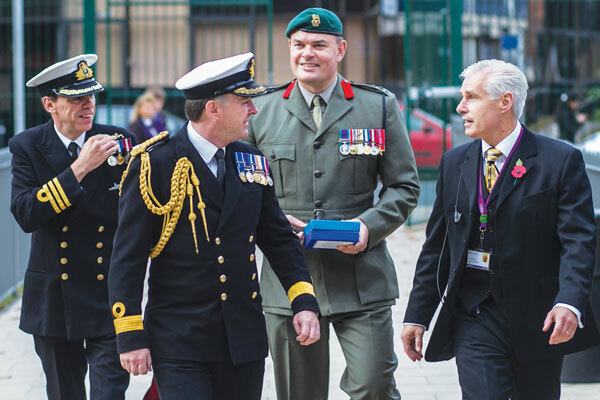 The new building was officially opened at Charter Academy last week with the help of a high-ranking Royal Navy officer in a ceremony that marked the end of 18 months building work. About 60 VIPs attended the ceremony to see Commodore Jeremy Rigby cut the ribbon. Guests were entertained by the school’s rock band as they entered and treated to a performance by the Corps of Drums from the Royal Marines School of Music.